Spring is here! It is finally getting warm enough to work in the shed without wrapping up like an Arctic explorer. Time to get things set up for the summer. 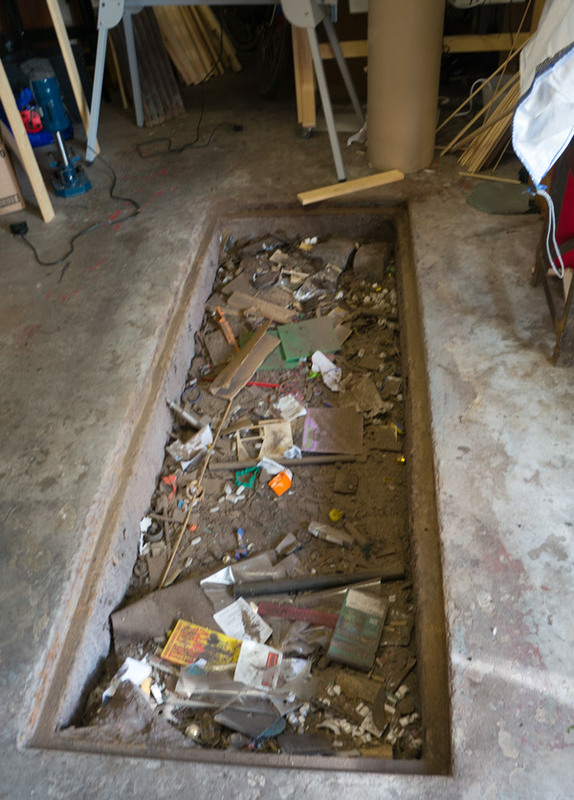 There is a weird sort of shallow inspection pit right in the middle of the shed floor. It is covered with a metal grating and it has to go. Here it is with grating removed. I guess if I left it long enough it would just fill up with general shed detritus and the floor would naturally level out but I thought rather than waiting I’d have a go a filling it myself. 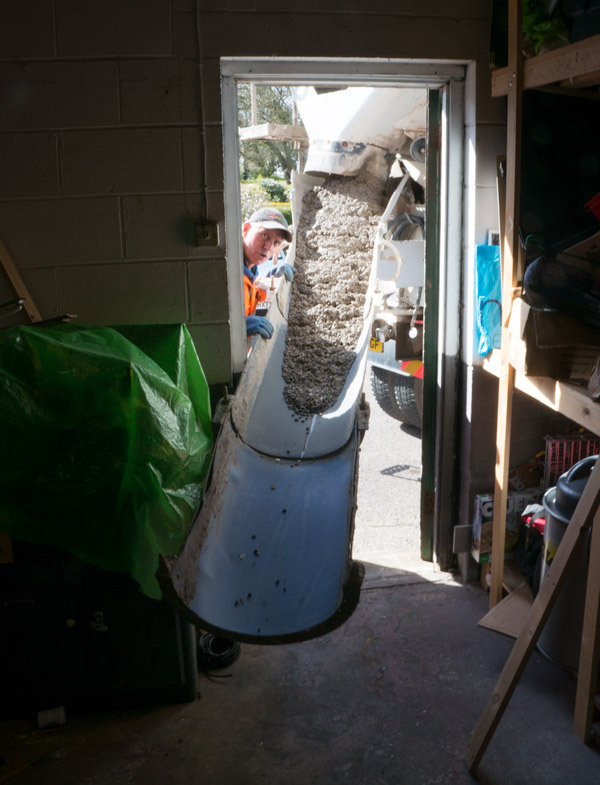 So yesterday I booked 0.7 cubic metres of concrete and today the nice chap from Handy Concrete came round with his truck. After some skilful manoeuvring on his part we had the chute just a metre or so short of the pit. Time to start pouring! The chap from Handy Concrete was great, really helpful We shovelled the liquid concrete into the hole and I levelled it out with the edge of a long plank. He’s the result. No cat paw prints in it so far. By morning I’ll have a far more useable space. Those shelves on the left are coming down to be replaced by some high up narrow shelves and some work benches. 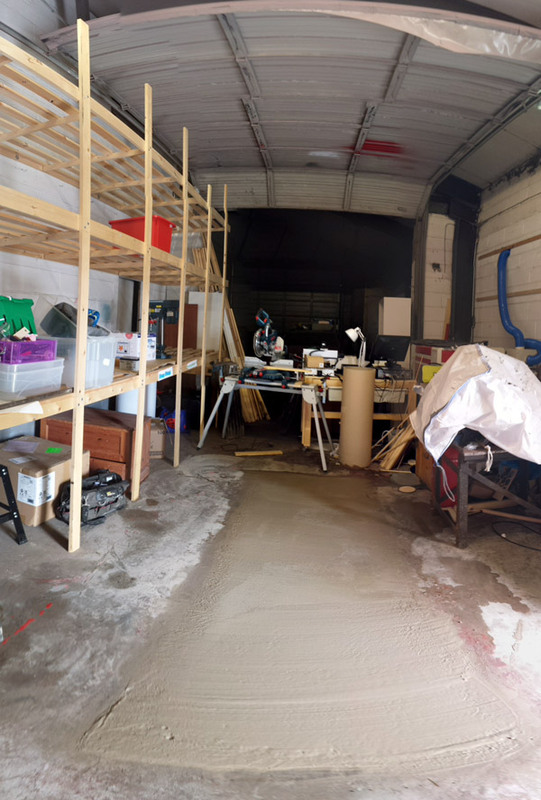 I’ll then close the big roller door at the far end and have storage behind me from the picture point of view, workshop tools in the middle and a little photo studio at the far end. IT’ll be nice not to have to keep packing up the studio lights! In the mean time I’ll really have to sort out some heat for winter. Brrr!